Hunting seasons are kicking in all across the country, sending some 11 million men and women into the wildlands. Additionally, 29 million Americans gather wild nuts, berries and fruits. Everyone who ventures into wildlands should be able to identify plants like poison ivy, poison oak, and thistles. They also should know where snakes might hide, where to step and not get wet or muddy, and how to carefully climb a tree-stand. Unfortunately, another wildlands hazard has developed over the last 30 years or so – illegal cartel marijuana grows. California has the most, but trespass marijuana grows have been found in 23 states and on 72 national forests. Other states with significant cartel gardens on national forests, national and state parks, BLM lands and USFWS wildlife refuges include: Colorado, Oregon, Michigan, Wisconsin and Kentucky —especially in the Daniel Boone National Forest. Almost four million plants are removed from illegal grows on public lands nation-wide every year, less than 20% of what’s actually out there. Lt. John Nores, head of the California’s game wardens tactical unit that focuses on eradicating trespass marijuana grows on wildlands, and co-author (with yours truly) of War In The Woods, http://jamesswan.com/book-war_in_the_woods.html says that at least 3,000 to 5,000 organized crime-operated “trespass grows” are identified each year on California’s wildlands. Many are in excess of 1,000 plants per site, and some can go up to 200,000 plants. Each plant has a street value of over a million dollars. Understandably, growers want to protect their crop. And early fall, before temperatures drop into freezing, is the prime harvest time. Recreational marijuana is now legal in nine states and medical marijuana is legal in 30 states. In California, in addition to medicinal uses, adults over the age of 21 can legally use, possess and share marijuana—and grow up to six plants at home. Recreational sales became legal in 2018. You’d think this would cut into the black market, but so far the opposite is true. Black market marijuana is cheaper and people can buy it and sell it without paying taxes. Encountering a trespass grow site is a new wildlands danger. Most of the growers are heavily armed and trails leading to grows are frequently booby trapped with trip wires and punji pits (camouflaged underground beds of sharp poisoned sticks). According to Lt. Nores, growers typically use deadly illegal chemicals to grow their illegal pot. “There can be serious health hazards associated with the EPA banned poisons Furdan, Carbofuran, https://en.wikipedia.org/wiki/Carbofuran Metaphos, Q-Furan etc. that growers typically use. While trade names vary, they all contain nerve agents found in nerve gas as developed by the Nazi's and kill wildlife and humans within minutes when very small amounts are ingested. One 16 ounce container can kill over 2300 humans and two table spoons full of the undiluted crystalline substance can wipe all living aquatics for several miles within pristine waterways. Nine of every 10 illegal marijuana farms raided in California this year contained traces of powerful and potentially lethal pesticides that are poisoning wildlife and could endanger water supplies. Carbofuran is so powerful that a quarter-teaspoon can kill a 300-pound bear. Frequently dead squirrels, bears, and birds, and other animals are killed by these pesticides, and if the chemicals seep into streams, salmon and trout also may be killed. 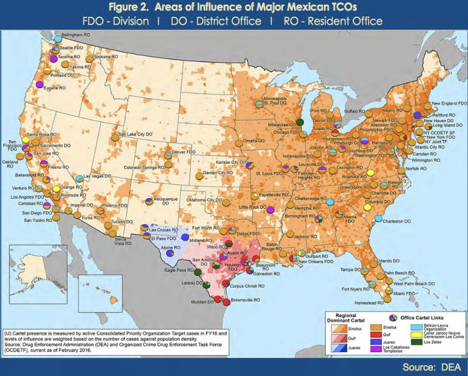 In July a deputy sheriff in Mendocino County, in northern California where more illegal marijuana is grown than any other place in the US, while enforcing a search warrant, came into contact with Metamidofos, a highly toxic banned pesticide. https://www.pressdemocrat.com/news/8561056-181/mendocino-county-sheriffs-deputy-hospitalized The pesticide can be absorbed through the skin or inhaled and can cause nausea, vomiting, sweating and respiratory issues. The deputy was treated at a local hospital after he began experiencing stomach problems that progressively worsened and is still under supervision. 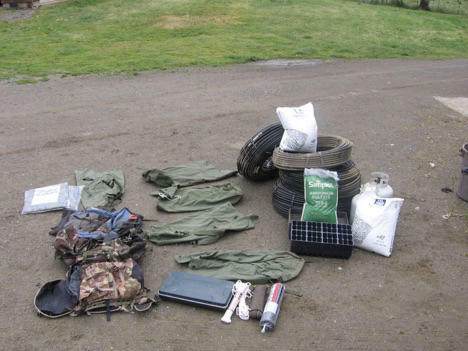 Gear, including fertilizer, pesticides and black plastic irrigation piping, confiscated from four growers caught hiking into a trespass grow. In a press release, the Sheriff’s Office cautioned members of the public and other law enforcement officers to use extreme caution when coming into contact with illegal marijuana cultivation as toxic chemicals are “now frequently found” in such operations. So, how do you avoid having such an encounter? Black plastic pipes bring water into this pond where toxic chemicals are added and then the toxic water is sent to the garden. First, most all trespass grows are irrigated by black plastic irrigation pipe that carry water from up to a half mile away. In most gardens each plant has its own special pipe and even a timer for irrigation. 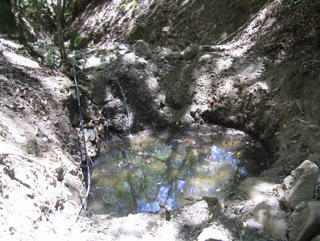 Typically, before the irrigation water reaches the garden, it dumps into a pool or a small dam on a stream, where chemicals are added. Recent research in California has found that about 90% of black market marijuana contains chemical poisons. And you may also overhear voices, typically which aren’t speaking English. Lt. Nores says about 85% of all growers they catch are illegals. In all these cases, quietly retreat, retracing your trail. Don’t linger at the site, or touch anything that looks out of the ordinary. Then, when you get a safe distance away, call in the location of the grow if you have a cell phone, or report it when you get out of the woods. Unless you’re a combat veteran, it’s difficult to get a sense of what it’s like to be part of the team that focuses on eradication of a grow. That has changed with the recent release of a 24-minute documentary WAR IN THE WOODS: Raid to Reclamation by American Zealot Productions.